If shopping is your sport, prepare for some Texas-sized activity in San Marcos. An outlet mall wonderland lies just a hop, skip and a jump from Kissing Tree’s entrance. One of Texas’ most popular tourist destinations, it’s actually two malls side-by-side, offering goods from a total of about 250 popular brand-name retailers. 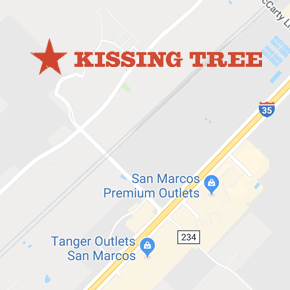 Follow Centerpoint Road under I-35 for less than five minutes, turn left, and you’re at San Marcos Premium Outlets. Top design labels including Prada, Coach, Kate Spade, Michael Kors, Vince, Tory Burch, Gucci, Giorgio Armani, Salvatore Ferragamo, Fendi and Burberry are among the draws there, along with J. Crew, Lululemon Athletica, Saks Fifth Avenue Off Fifth and Neiman Marcus Last Call. Turn right, and you’re in Tanger Outlets territory where Eddie Bauer, Disney Store, Fossil, H&M and Old Navy and many other mainstream favorites are in the mix. A few retailers, including Banana Republic, have stores in both malls. Wear your most comfy walking shoes, pace yourself and go early – preferably on weekdays – to beat the crowds. Not everything is a steal, but 25 percent discounts are standard. The apparel store racks, especially, can be full of cheaply made goods manufactured for outlets, but you can ferret out better deals on top quality merchandise. Before you go, check the centers’ websites for special deals and information on coupon books. Since you’ll have a new home to furnish and a new kitchen to stock, here’s one strategy for a day of hunting and gathering. Start at the far north end of the Premium Outlets mall. At the cavernous, combined Pottery Barn and Williams Sonoma Outlet, shelves are stacked with tableware, cookware, decorative items, linens, small appliances and even some foodstuffs. In the middle of it all: lots of furniture – definitely a good place to start if you need a pick up piece or two. A few doors away, the Restoration Hardware outlet is smaller but offers a similar mix of goods, all familiar from the catalog – including cool lighting options. If you’re updating your music system, visit Bose. Stock up on pretty bath and body essentials at Crabtree & Evelyn or L’Occitane. Cross over to the Tanger Mall to check out West Elm’s linens, tableware, decorative goods and furniture. If your aesthetic is modern and minimal, you may even want to start there. You can also stock your kitchen on the Tanger side, with gorgeous cookware from Le Creuset, and a good selection of utilitarian pieces, bakeware and utensils at Corningware Corelle & More and Kitchen Collection. If there’s formal dining in your future, look for classic place settings at the Waterford Wedgwood Royal and Doulton outlets.